In Taika Waititi’s Thor: Ragnarok, the Norse god will get his hammer broken, his beautiful hair cut, and he’ll even be forced to duke it out with his “friend from work” the Incredible Hulk. But the one threat that he and his adopted brother Loki won’t be prepared for on Earth is a deeply troubling one indeed: fan girls. In an interview published Thursday by Collider, actor Tom Hiddleston revealed a lot about Loki’s new motives, outfits, and experiences in Thor: Ragnarok. 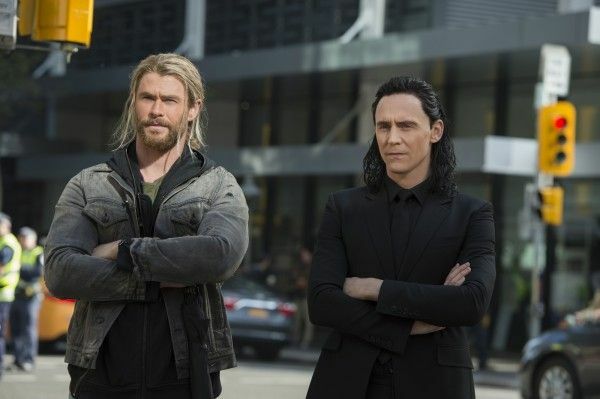 Thor and Loki have always had a tense relationship, and as they’re forced to unite against Hela, they’ll team up once again and have to deal with the resentment they have for one another. It doesn’t help when random girls geek out over seeing Thor. The post-credits scene from Doctor Strange revealed that Thor goes to New York City looking for his father. Presumably, before Thor meets up with the Sorcerer Supreme and hears an ominous prophecy, he and Loki encounter some fan girls on the street. This will totally annoy Loki. Loki and Thor wield some guns. It’s easy to imagine Thor basking in the attention while Loki simmers with loathing and contempt. Who knows how Thor goes from wandering New York City meeting fan girls across the galaxy to a trash planet where they don’t allow long hair. One thing’s for sure: Thor: Ragnarok’s going to be a wild ride. Thor: Ragnarok hits theaters October 25, 2017.